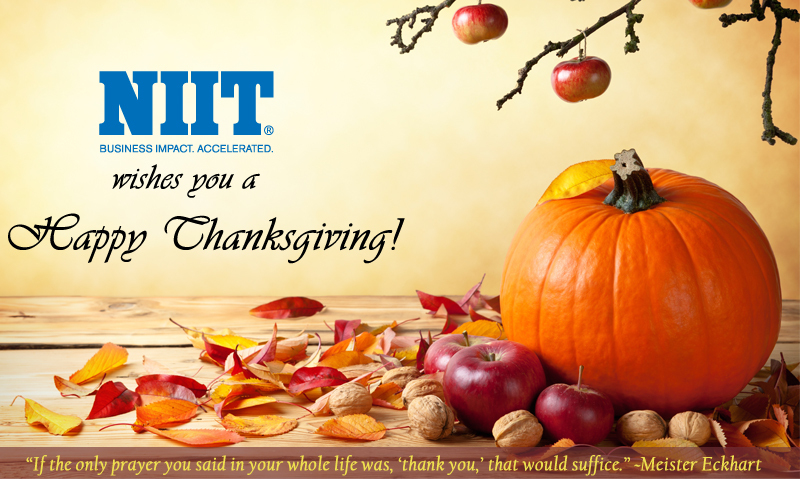 NIIT wishes everyone a very Happy Thanksgiving! Today, I want to talk about moving from the backroom to the boardroom. So, what do I mean by that? I have this strong drive to help training reposition itself from its functional orientation to a business orientation, which if it does, will allow it to not only be in the same room with business people but also sit at the table (as opposed to looking in through the door or sitting around the outside wall). How do we get from the backroom? How do we get from not being considered an integral part of the business to one where people look to us much like they do with sales, marketing, manufacturing, finance, or IT and get engaged in business discussions that allow us to bring forth the kinds of insights and capabilities that we know are possible to make a difference for the business. And I think that, in-fact, is the essence of the challenge. When we have conversations, do we have conversations with the people who are running the business? •	Do we ask them what their expectations are of us and how we should serve them? •	Do we understand the key capabilities they need in their organization to advance their objectives? •	Do we know where we’re coming up short in our performance? •	Do we know where the priority areas are for us to make a difference? •	Do we talk their language? •	Do we talk in terms of profitability, productivity, customer satisfaction, and customer retention, or do we talk about training programs, competency, e-learning, classroom training, and how many training classes have been taken in their organization? Those are the things that I think make the difference between looking in through the window and sitting at the table. •	We have to understand how the business operates. •	We have to understand the various levers that organizations can pull and be broader than just training people. •	We need to be business people in training, which means that along with expertise in our special area called training, we must have the skills of business people who can look at financial sheets and say, “There’s an issue over here with fixed cost or variable cost, or how we’re doing SG&A or what’s our level of SG&A.” Things like that. So, I submit that we have to think differently, act differently, talk differently, walk the halls of the business, and stop in and sit down with business people and say, “What’s on your mind today? What challenges do you have? What’s keeping you up at night?” All those things will eventually lead to us to being invited inside the room and given a sit at the table and moving, in-fact, from the backroom to the boardroom. I think it’s critically important. In my book Running Training like a Business, what we said is that one of the reasons why business executives are sold on learning (and not sold on training) is that they see improved performance, but only sometimes. It is inconsistent and they don’t know when to expect it. They don’t have confidence in us that when they invest in us, they’re going to get something for their investment that exceeds the investment. And I think if we can get aligned to that, then the path to getting there is pretty clear. And, in-fact, if you look back on the blogs that I’ve offered up, you will see some of the ways in which you can advance your organization to where it moves, in-fact, from the backroom to the boardroom. • We don’t have the same thing being done in multiple ways across the organization. • We have single-technology solutions. • We’re doing all the low–value-added, but really important work in a highly advantageous manner, so that we can get the benefits of scale and leverage of resources. • The very first element is about business linkage, which determines whether you are tightly linked to the needs of the business and whether you are having conversations not about what training you need, but about what business objectives do you have, what challenges do you have in accomplishing those objectives, and how can training be a lever to move the needle on whatever it is you’re trying to accomplish in a positive way. So, business linkage was one of the measures. • A second measure was related to impact and ROI. • There were also a number of self-assessment measures around things like having the right resources available and utilizing the right processes…those sorts of things. And when I ask them that question, they don’t have good answers. And then the conversation goes, “Well, we don’t have a measurement process and we don’t know how to do it” and this and that and the other. And I would argue that you got to have some sort of measurement process that begins at the beginning of anything you do and takes you through to the point where you can ultimately say, “I have delivered some value,” and that your customers acknowledge that. And over time, we hope that we consistently demonstrate value through the work we do and with the measurement processes that we have in place, whatever they may be. There are lots of books out there that talk about how to measure. However, we need to consistently demonstrate it so that we build confidence in our customers that when they invest in us, they’re going to get some value. At that point, I believe, we can stop investing in the measurement process and start doing more value creation work so that our businesses benefit more significantly from their investment in us. • By that I mean what the employees of training, for example, feel like when they leave at the end of the day: they made an impact on the business and the organization looks at training as a business enabler. The organization and its employees benefit from improved skills and capabilities that they can, in turn, apply to their work and create value from the work they do because they are better equipped to do that. So, that’s it for this blog “Running Training like a Business.” I welcome any and all comments and questions, and if anybody is interested in the self-assessment, please let me know via the blog. I’ll be happy to send you a copy of it so that you can do a little bit of the work on your own for your organization. I just returned from a trip to Amsterdam and Paris where I met with six companies and the topic of conversation was “Running Training like a Business” and how they could, in fact, do things differently than they are doing today, such that they could follow many, if not all, concepts of “Running and Training like a Business” and deliver more value. So, I thought I would use this blog today to talk about the topic and what it means and, perhaps, even how you can begin to show movement toward the concepts that are discussed in detail in my book. So, what is “Running Training like a Business?” I think at the end of the day, it’s about transformation. As we say in the book, making this kind of transformation is not for the faint of heart; it is tough work. It requires changing the way we think, the way we act, the way we talk, and the way we interact. But fundamentally, we talk about the twin tales of effectiveness and efficiency in the context of “Running Training like a Business.” So, what are those things? •	Effectiveness is all about creating value, seeing yourself as a business, seeing yourself as an enterprise versus a function, talking the talk of the business, measuring yourself by your customer success (not by all the stuff that we traditionally measure ourselves by, like volumes, classes, courses, events, competencies, and all those sorts of things). Instead, we measure ourselves by results being delivered to our clients in the form of increased revenue, increased earnings, improved productivity, reduced cost, and those sorts of things. So that’s the effectiveness side of running training like a business. 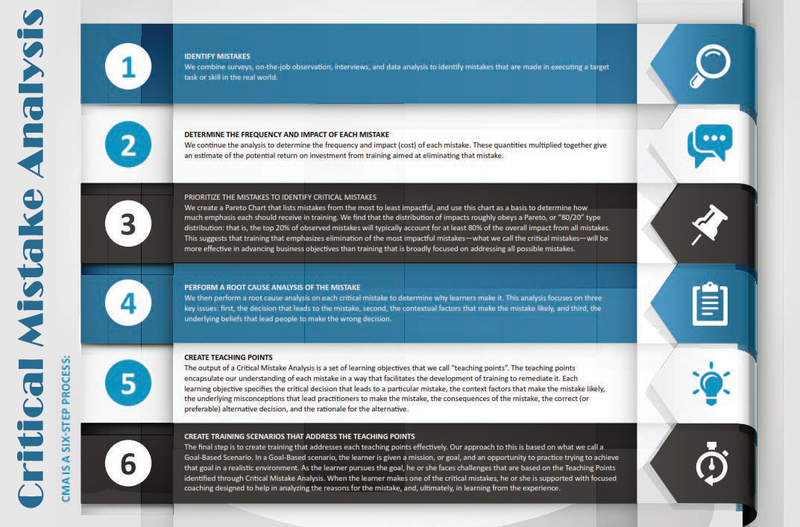 •	The efficiency side, which is the other half of the twin tales, is all about getting cost to acceptable levels, uncovering and exposing hidden costs and getting them under control, and managing the total cost of training as opposed to just what’s visible. What we know is that in any corporate training budget, what you see represents only a small portion of the direct spend normally in an organization and it’s particularly dramatic in a decentralized organization. But having said that, even in a decentralized organization, the budget represents a small percentage of the total cost because another 2-4 times that number is being spent in indirect costs that have as their makeup things like the cost of time off the job, the cost of poor quality, travel cost, and those sorts of things. The most important is the loss of opportunity cost, which is the fact that people aren’t creating value for the business while they are off the job doing whatever level or amount of training that they’re trying to do. So, the dilemma we have here is that there’s this huge mandate for training these days. It’s about improving effectiveness, reducing costs, becoming more relevant, and delivering value. Yet, when we look inside many training organizations, what I have seen (anyhow, I can only speak for myself), is a broken investment value equation, which means that there’s insufficient value being delivered for the investment being made. And that’s a difficult place to be because you never know what happens when executives have to make decisions about where they invest money. They lay down all their options side by side and they look at those options in terms of investments and value being delivered, and if we’re coming up short on the training side, then we’re likely going to be impacted by a decision. It’s not going to be a positive one; it’s going to be about taking costs out, stop doing some things, or reducing resources. This is opposed to what I believe is a really important element to the work we do, which is, when times get tough, you would think that companies would invest more in training, not less, because there’s demonstrable evidence that companies that invest heavily in training get really sizably improved productivity from their employees. So, you would think when times are tough, your organization needs improved productivity to get out of the difficult times. The organization would invest more in improving skills and capabilities; instead, the opposite happens. And it’s all a result, in my mind, of the fact that we have not delivered sufficient value for the investment being made.